My goodness, don't you just want these shoes! Read more so you can find out more about them! These shoes are SOOO cute!!! I absolutely love, adore, cherish these. I just wish I could get my hands on a pair, if I could I would love them forever. 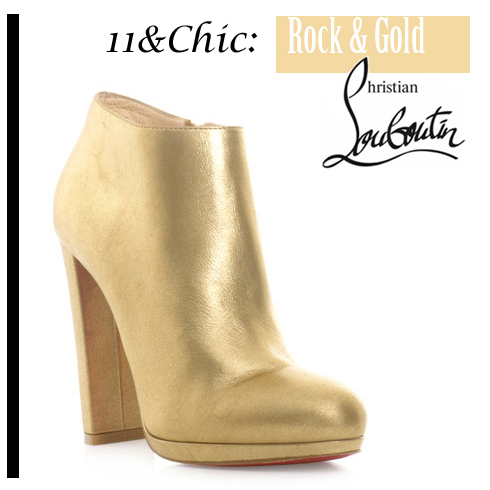 These gold leather Christian Louboutins boots are size 11 available (41 EU) and absolutely gorgeous. I would dress these up and take them anywhere. Just to make a statement. 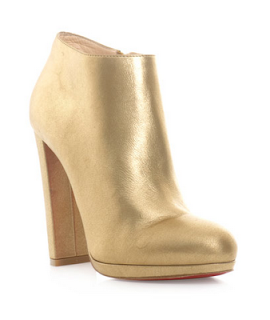 Because these can literally be dressed up for an evening event or dressed down for a stylish and great daytime look. They are a bit on the expensive side, but my gosh if you had that kind of money stored up somewhere wouldn't you feel tempted....just a bit... to let it all go and spend the money on these... maybe. Let me know if you would make a wild and crazy move like that in the comments below! All you need to enter to leave a comment is your email address or Twitter or Facebook login. Leave me a comment I'd love to know what you think! Where would you specifically wear these, let me know your shoe dreams for these! Come back next week & have a great weekend!